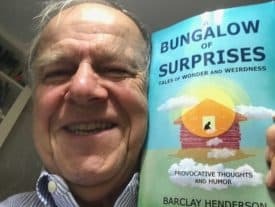 Barclay Henderson, a student in Dave’s online humor writing course, has just published his first book, A Bungalow of Surprises. The following story is a chapter from his book. You can order A Bungalow of Surprises on Amazon. The R-word – “retirement” – has a stigma. I’m no longer an economic producer; I just consume. But it’s a transition – no different than the transition from the classroom to the office, or from carefree dating individual to mortgage-paying PTA parent. The trick is to make the change a well-conceived journey. An eight-year-old girl can help…. Ever meet people who see aliens? I know guys who talk with the dead. It gives me the creeps. I view mystical people with humor, suspicion, or both, but I try to change the subject and hold on to my wallet. The supernatural never served me well in my career. “Get the hell out of my office!” That’s what my banker would say if I brought out a deck of tarot cards. If crystal balls and Ouija Boards really worked, I would have seen them in the stockbroker’s office. Never did. In all my years in business, paranormal phenomena didn’t fit in. I never used to think about the mystical. Experience has taught me not to be baited into religious or political debates with adults. So why should I get sucked into a debate with a child about her take on pixies? I tried to keep any further dismissive thoughts to myself as we continued walking, but Molly persisted with the discussion. This was an eight-year-old who had spent her life contemplating and studying pixies. You might say she was an expert. Grandpa was not going to evade the conversation. Not that easily. Suddenly she looked less eight and more like an angry parent. Was I supposed to feel like a naughty child in this routine? “I am paying attention!” I responded. 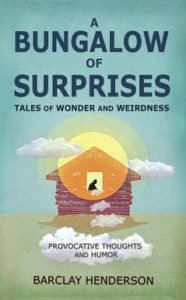 “A Bungalow of Surprises” by Barclay Henderson is available from Amazon. I’m an open-minded guy. I have accepted many unexplained things: the astronomical mysteries of black holes, the spooky world of quantum physics, the life-altering powers of apple strudel, and the beauty of properly functioning sphincters, to name a few. But pixies? I think not. We grandfathers have to have to draw the line somewhere. We have standards. As Molly and I continued down the dirt road, she eventually stopped talking. She seemed to have given up on me and had shifted to silent treatment mode. The quiet grew awkward. A horsefly buzz filled the void. I was beginning to think quality time together wasn’t always high quality. Of course, at Molly’s age, there was a solution. For the price of an ice cream cone, which she shared with the pixie, all was forgiven and forgotten. At the time of my walk with Molly, I was newly retired, whereas she had a few years to go before starting her career. Neither one of us was anchored to the same reality as, say, middle-aged, fact-filled, working parents. I pondered our differences in life’s stages, and it occurred to me that in retirement, I should be looking for different perspectives. Cantankerous old retirees should seek “enchantment and wisdom.” I didn’t confess any change of mind to Molly but I did resolve to pay more attention. A few weeks later, my own “bungalow of stories” moment arrived. I experienced a type of enchantment in our garden in Woodstock, Connecticut. It was a late September afternoon and I noticed little hummingbirds flying in a strange pattern. They were at eye level, perhaps five feet in front of me. Now that I was trying to see enchantment, these birds became pixies as they continued for a minute of fearless aerobatics. I was beginning to think we had a relationship going until the little Ruby Throats dive-bombed above my left ear and made hairpin turns like space aliens. It was frightening. What if they missed a high-speed maneuver and crashed their needle beaks into my wrinkled old forehead? The episode was disorienting – as if I’d drunk something weird, like my wife’s new powdered, Japanese tea. 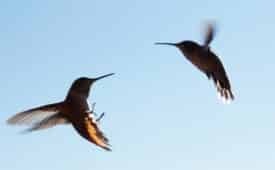 Then, after a minute of buzzing around my head, quick as a flicker, the hummingbirds took off. I never saw them again for the rest of the year. Months later, after winter had ended, they returned with more strange antics. Minako and I were sitting hidden in the screen porch. Back the hummingbirds came with fresh aerial acrobatics outside our window. They seemed to know we were watching, and that we were their benefactors who kept refilling the sugar-water dispenser. For ornithologists acquainted with birds’ habits, there may be no magic in this at all, but I found it a delightful, out-of-this-world experience. Although these little creatures had brains the size of the iris in my eye, I still felt an anthropomorphic communication between us. Since then, I have continued to pay attention in the garden. It’s clear something weird takes places every time these strange little birds are at play. Fluttering birds are not exactly “breaking news” like a Big Foot sighting, but they taught me about Molly’s mystical, dirt road observation, and about paying attention to the inexplicable. Now that I have veered off the Career Super-Highway, I spend more time walking slowly down the Retirement Dirt Road. Now, there is time to examine inexplicable, enchanting things more carefully. I mostly walk alone now because Molly is older today. She is turning onto her own Career Route Interstate. Her world is rapidly filling with her own “warehouse of facts.” Soon, she will be doing budgets and taxes, and balancing family and career. She will submerge her thoughts in all the nuts, bolts, and facts of the career life that I have left. Then, decades from now, she will retire and enter into a new reality. Like a caterpillar emerging from the confining career stage of life, she will open up in retirement as something new – like a butterfly. She will rediscover some of the enchantment that escaped her middle-age career days. When that time comes, I hope she will be so lucky as to have her own eight-year-old companion to walk her slowly down that dirt road. Barclay Henderson is a retired real estate and restaurant entrepreneur turned humorist. He published his first collection of essays, A Bungalow of Surprises: Tales of Wonder and Weirdness, in 2017, and is currently working on his second book. He lives in Cambridge, Massachusetts, with his wife, Minako.